The most important thing you need to know is that Arizona law as well as United States federal law requires all employers to verify that all of their employees are authorized to work in the United States. This means two things in Arizona. Federal law requires that every employer fill out an I-9 employment eligibility authorization form for every employee they hire. The employer and the employee each have different parts to complete on the form. Filling out the I-9 form is absolutely critical. Failure to fill out the I-9 form (or failure to fill it out correctly) can result in hundreds or thousands of dollars of fines to the employer. The fact that the employer didn’t know they were required to fill out the I-9 form is not a defense. Employees need to complete their portion (Section One) of the I-9 form no later than the first day they are employed. The employer can finish his portions (Sections Two and Three) within the next 3 days. The employer is also required to view original documents presented by the employee that establish the employee’s identity and eligibility to work. There is a list of all of the acceptable documents contained on the I-9 form itself. One mistake that many employers make is that they tell the employees which of those documents they want to see. If the employer tells employees that they are required to show a specific document and the employer will not accept anything else, that is called “document abuse”. Sometimes that is used to discriminate against foreign-based or foreign-sounding or looking people. Sometimes it is used to discriminate against US citizens. And often, it is not done with any improper intent at all and the employer is just trying to simplify the process. But regardless of the reason, it is still document abuse. An employer can never demand that only a certain type or types of document be presented. Employees are always free to produce whichever of those documents listed on the I-9 form they want. 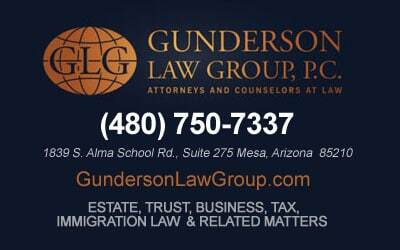 Learn About The Mesa Arizona Immigration Services With Gunderson, Denton & Peterson, P.C. Once the I-9 form is filled out, Arizona employers must run the employee’s I-9 information through the E-Verify system. E-Verify is an online system used to verify employment authorization. It determines whether the name and the social security number of the employee match. Every employer in Arizona is required to use the E-verify system. Unlike the penalties to employers of not completing the I-9 form, there is no direct penalty under the Arizona law for not using E-Verify. However, if you are found to have actually hired unlawful workers, and you did not use E-verify, the state of Arizona can take away your business license and completely shut down your business, so it is very important to comply. There are many complexities in immigration law and its effects on small business owners in Arizona. Although the I-9 form may seem very simple, I-9 auditors usually discover errors on 50% or more of every group of I-9s that they review. Each error (on a single I-9 form) can generate fines of hundreds of dollars, so if there are dozens or hundreds of employees, the potential liability can be huge. For that reason, having an I-9 audit performed by an outside expert is a valuable precaution. An experienced immigration lawyer can provide you with the necessary legal advice to help your small business comply with these important laws. I-9 Record keeping is still an important requirement for all employers and one that is often overlooked or forgotten. Small business owners should be aware that a new Form I-9 (Employment Eligibility Verification) was released on November 14, 2016. The new form (available here) can either be printed and filled out in paper form or can be completed online. The instructions are now contained in a separate document. Employers should review these instructions each time they complete a new I-9. For forms that are completed online, a quick response (QR) code is automatically generated when the employer prints the form. This code can be read by most QR readers and should help streamline the processing of I-9 records. Currently, employers may continue to use the old form (last updated on March 8, 2013), but effective January 22, 2017, employers should only use the new version. The information in this blog does not constitute legal advice and is for general information purposes only. Please contact an Arizona immigration lawyer for more information. Arizona Attorney » Legal Blog » Immigration » As a small business owner in Arizona, what should I know about immigration law?